Maybe it’s only because I re-read it this week for a class I’m teaching, but this story strongly reminds me of “The Enormous Radio” by John Cheever. Which is a compliment. He’s devastated. He goes on long walks and hears snatches of conversations that aren’t at all comforting. Same on the subway, in shops, etc. These fragments of conversations are what remind me of the Cheever story, in which the husband and wife hear through their new radio various revelations about the goings on in their neighbors’ apartments. Interestingly, in the Q&A with Joshua Ferris, the author mentions other Cheever stories because of their subject matter, but not this one. If there’s a complaint I have about this very enjoyable story it might be that the title is too obvious. The snippets of conversations are fragments, the guy’s life is blown to fragments, and he begins giving away his wife’s possessions, fragments of their marriage. A little unsubtle, I thought. Also, the subject of adultery is a little tired, and while the take on it is relatively fresh, the story doesn’t go far enough to add depth to that subject. 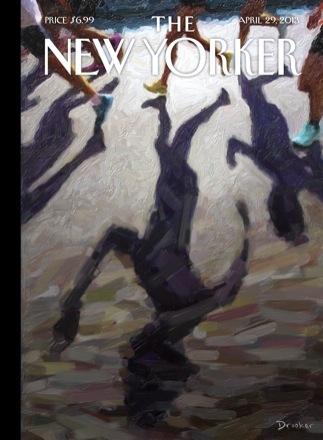 One of the worst stories I’ve read in the New Yorker. I don’t necessarily disagree with your take, but I can’t forgive the defects such as the well-worn cliched themes. “He watched the ground but remained oblivious of the pennies, the gum stamps, the pigeons twitching in the cold.” If the central character is so “oblivious” to all that, who is conveying the information to the reader?? It seems to me that we’ve made a sudden detour from third-person limited to third-person omniscient and then back again. Very jarring. I felt used by the author – in the Q & A in the New Yorker Ferris said these were random snippets of conversations he overheard, anyone could do this, where’s the art?! I overhear conversations all the time when out in public on a busy locale. Otherwise, the style was good.